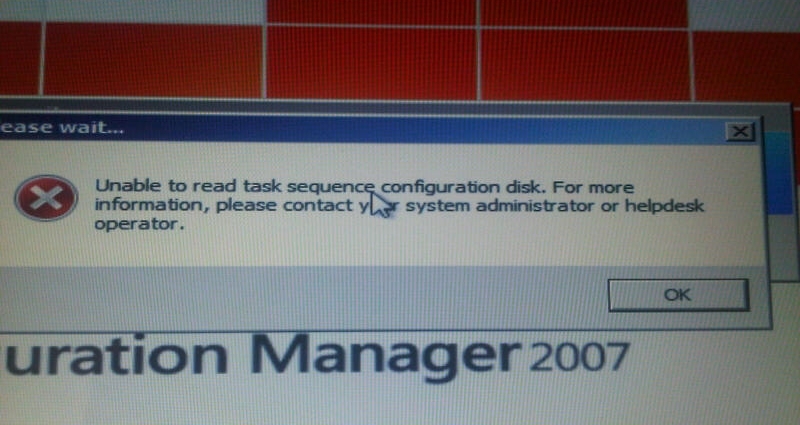 SCCM 2007 R3 "Unable to read task sequence configuration disk." If drive letter is not allocated to boot partition i.e. C you will get the error above. Please check your Task Sequence and make sure you’re assigning one under “Format and Partition Disk” step. If you guys have any questions or suggestions how to tackle the error above please leave your comments down below! I dont see any missing drive letter, still i’m getting error. I see this error only on Sandisk cruzer USB drive not on any other. Hi, did you connect your USB stick to USB 2.0 port on the back of your machine? If you don’t have USB 3.0 drivers added to your boot image it’s likely you will get the error message. Also disk part the drive to make sure there is no partitions. Hi, this resolution may works for some cases that the USB 3.0 drive/Stick(some like Sandisk ultra) connector pins is not aligned to USB 3.0 Ports,USB/stick gets detected by WinPE only if it plugged half into the USB 3.0 ports, then reads the task sequence and continues the installation process.